(1) The \"phantom chain\" or \"broken chain\" that appear in some workunits are OK -- they\'re new science modes we\'re testing that either focus on specific parts of the protein or rearrange the protein topology to better sample long-range contacts. have been put back into ralph. But they\'re not on by default. We\'ll ask Rom to post here and fill you in on how to turn them on. (3) We\'re testing a new science mode which uses the sequence and structural information from homologous proteins in an early phase of the simulation, but then returns to the target protein sequence in the final refinement phase. (4) We\'re also continuing our efforts to reduce memory usage by rosetta/ralph! Message 1598 - Posted: 12 May 2006, 21:28:46 UTC - in response to Message 1596. WU numbers are 97527, 97483, 97460, 97440, 97430, 97382. Message 1605 - Posted: 13 May 2006, 1:50:16 UTC - in response to Message 1601. ALL of these groups of errors look like a bad batch of Work Units. I have over 20 on each of my machines as well. I will bring this to Rhiju\'s attantion. \"A new batch has been queued up. These should pass through very quickly. Sorry for the inconvience.\"
Message 1606 - Posted: 13 May 2006, 3:26:49 UTC - in response to Message 1605. I\'ve got a couple of the new WUs (HOMOLOG_ABRELAX_hom*) and they seem to be running fine, almost an hour in. Fetched a new WU, this time it started w/o error. This causes the RMSD/Lowest Energy graphic to vanish, only a single red spot at the left edge is displayed. And the description text is a bit too long. So nothing serious, everything else works fine, even the graphics! Accepted Energy is now below -216 for the second model. Seems like the stranding algorithm improvements work fine. Message 1608 - Posted: 13 May 2006, 4:33:26 UTC - in response to Message 1607. All of the CASP7 target Work Units will have this display type. All that you describe is normal (except the long text overrun). Since they do not know the structure, they do not have the RMSD value, the Natural structure, or any other comparative information so it cannot be displayed. Because the RMSD is unknown, this forces the value to zero and the red dots all display at what would be the zero point of the RMSD graph (to the left of the box). As close as they can get to the graphic we all are familiar with is to show the accepted and lowest energy shapes as they occur. Rhiju has said they will work on the text overrun. They worked fine without error at first. However, once BOINC client has been closed and restarted, the taskes which were being done more than half started from the beginning. Is it an error, or due to my preference of RALPH? In case anyone missed this on the Rosetta board, here is an interesting thought on why the debugger code might have been causing the many page faults. Message 1611 - Posted: 13 May 2006, 12:40:35 UTC - in response to Message 1610. So I think it would be useful, if all the guys with the \'hanging/slow\' machines post here what cpu type they got (HT/dual core/single core)! If the error occures only there, it would help the developers a lot! Message 1613 - Posted: 13 May 2006, 15:01:19 UTC - in response to Message 1609. Message 1614 - Posted: 13 May 2006, 15:18:04 UTC - in response to Message 1613. ...They worked fine without error at first. However, once BOINC client has been closed and restarted, the taskes which were being done more than half started from the beginning. Is it an error, or due to my preference of RALPH? 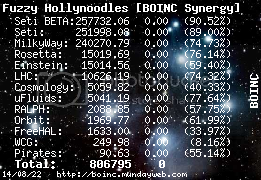 If the work units start, and then you stop BOINC before about 25-40 min of processing, or in any case before the percent complete is more than 1.4%, when you restart BOINC they will start from zero. Is it an unavoidable thing or an error with just this version? Message 1615 - Posted: 13 May 2006, 20:50:11 UTC - in response to Message 1605. Hi: I wanted to quickly apologize for the batch of bad WU\'s yesterday on ralph. Thanks for your patience! Its actually a new scientific mode in Rosetta, and I think I know why the WUs were failing on ralph. Will be testing the fix later today.